It was the best of weather, it was the worst of weather. Or so we thought. 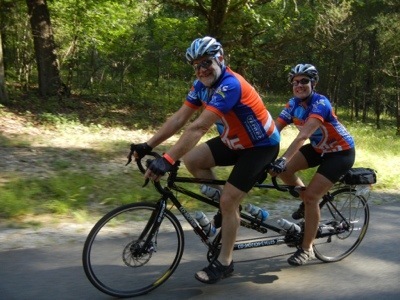 BRAG 2012 started on Sunday and we are riding our bicycle across the state for the 16th time. This year’s route is shaped like a “U”, starting in Ft. Oglethorpe in the NW corner of the state and ending in Tiger in the NE corner on Saturday. In between, we’ll stop in Dalton, Jasper, Roswell, Winder, and Cornelia. After registering on Saturday, we hit the top-rated restaurant in East Ridge, TN, Portofino’s. 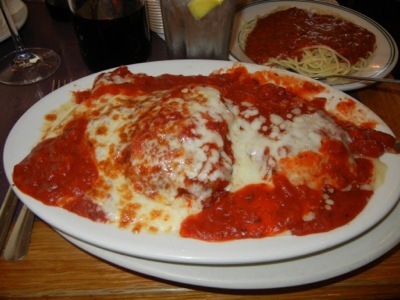 You have to carb up before a ride like this, and this dish was a combo of chicken parm, manicotti and lasagne. We are stuffed and we haven’t even ridden yet! 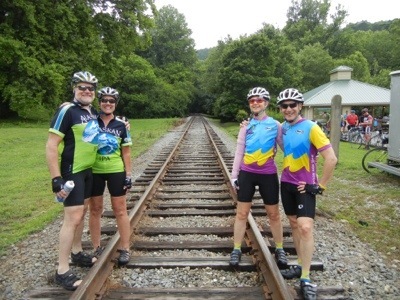 We start the ride on Sunday morning, crossing the GA/TN line back into Georgia. BRAG is usually held during the hottest week of the year, but the temperature is 57 today and it’s only going to be 75. We are actually cold at the ride start. 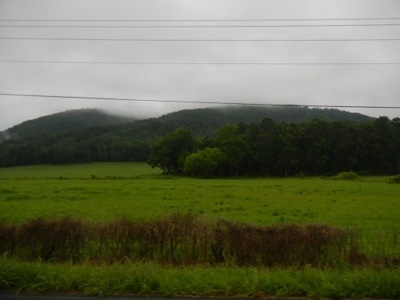 Soon we have ridden into the Chickamauga National Battlefield, our first visit here. The scenery here is beautiful, and combined with the incredible weather makes for a great day on the bike. 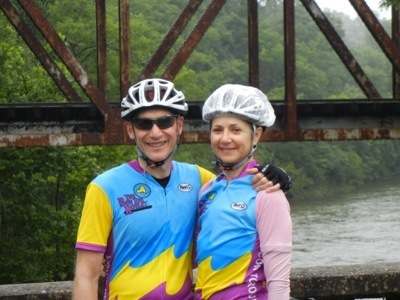 Our partners in crime for the second year in a row are Claudia and Randy Rowe from Smyrna. They are a blast to travel with and we look forward to our week together. Today is Eve’s birthday and we have ridden her age in miles. 35? 45? 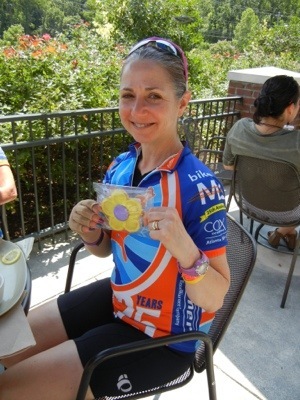 We’ll never tell, but after the ride, the birthday girl gets a cookie on her special day in Dalton, the carpet capital of the world. .
She also gets dinner at Outback Steakhouse, right across the street from our hotel. Remember, we have no car, so we have to walk everywhere. 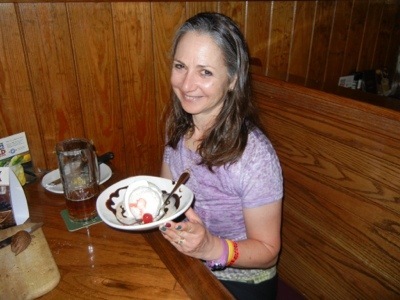 Outback gives her free ice cream for dessert, which is the prequel to our visit to the Dairy Queen next door. 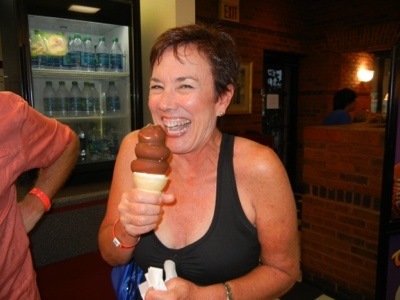 I have to post this picture of Claudia, because it has what we call her “ice cream smile”. We are all smiling and looking forward to Day 2, when we ride to Jasper. Day 2 starts with ominous weather news. It’s raining when we wake up and the radar looks terrible. We are going to have to ride in the rain, and that’s never pleasant, unless it’s a passing shower on a hot day. Today is not hot and these showers look like they are going to last all morning. We start riding around 7:30 and head for a nearby drug store to buy some cheapie plastic ponchos in case it gets really nasty. They aren’t open, but about 4 miles later, we find a CVS that isn’t open yet, but opens early when they see us outside the door. Ponchos on board, we set out in the gloom, expecting to get soaked. Eve is wearing a shower cap to fend off the rain, and she looks like a lunch lady today. Somehow, we don’t get rained on all day. The roads are wet in spots, but we stay pretty dry and the bike doesn’t get too filthy. We even got a couple of nice climbs in today. By the time we get into Jasper 56 miles later, we are hungry and tired and are ready for lunch. There is not a lot going on in Jasper, but Eve spies a restaurant, 61 Main, that was so good that we ate lunch AND dinner there. If you are ever in Jasper, check it out! 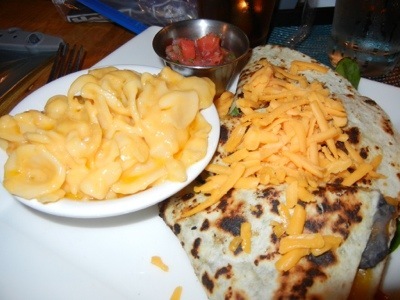 That’s the chicken quesadilla with a side of mac and cheese. We really can eat anything we want on this ride. 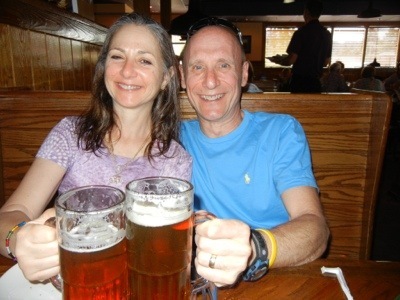 If you like this blog, check out our Friday Date Night blog. Previous Post Tandemonium! 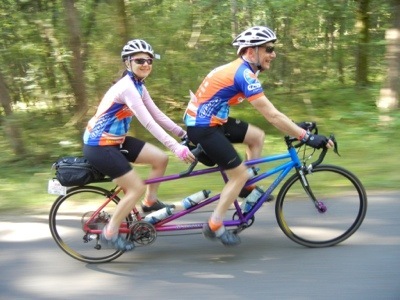 Four Bike Trips in Four Weeks! Jump right to the first entry of Coast 2 Coast 2017.